window known as "The Betley Window". 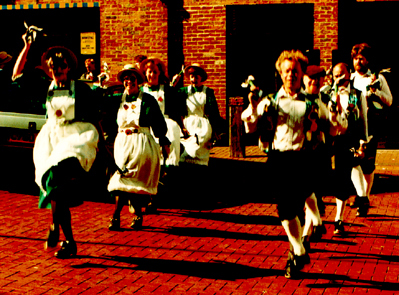 Morris dancers wear colourful costumes with bells on their legs, and usually carry either sticks or handkerchiefs. Some people believe that the bells, clashing sticks and waving handkerchiefs were once supposed to drive away evil spirits. Morris is traditionally associated with Whitsuntide, but, particularly in the English counties bordering Wales, teams of dancers would also go out and dance in Winter when outdoor work was scarce and the Morris provided them with the (strictly illegal!) chance of raising a small collection. Morris as we know it today is largely the result of the work of folklore collectors in the late 19th and early to mid 20th Centuries, who travelled England seeking out the last remnants and memories of the old Morris traditions. Thanks to them not only was the Morris saved from extinction, but it has enjoyed a massive revival. 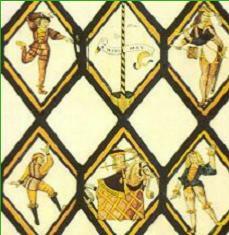 NORTH-WEST MORRIS comes mainly from Cheshire and Lancashire. It's usually danced in teams of at least eight and the figures can be very complex, though the steps are usually fairly simple. 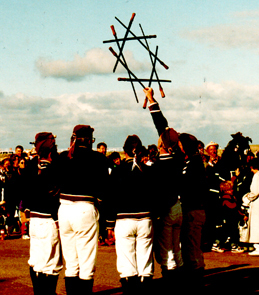 North-West teams often use implements such as garlands, "slings" of coloured rope, and short sticks decorated with ribbons and sometimes bells. The team in the picture is dancing in clogs. 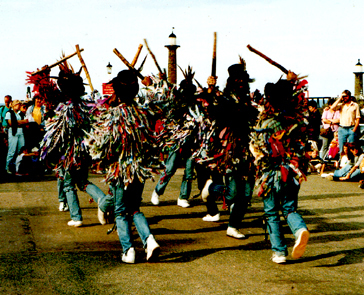 BORDER MORRIS is native to the West Midland counties of Shropshire, Worcestershire and Herefordshire. The dances - mostly stick dances - are usually fairly simple but very lively and showy, often accompanied by a great deal of percussion with shouts and whoops from the dancers. 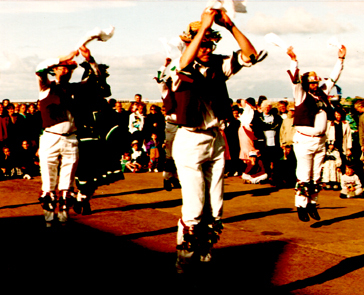 The "rag jackets" in the picture are typical of Border Morris costume. A Border side can be almost any number from three upwards - teams of eight are probably most common. SWORD DANCES are found in the North of England - chiefly Yorkshire, Durham and Northumberland. Unlike Scottish sword dances, in which a solo dancer performs steps over crossed swords on the ground, English Sword Dances are team dances. The six or eight dancers are linked together in a "hilt-and-point" ring, with the hilt of their own sword in the right hand and the point of their neighbour's sword in the left (needless to say the swords aren't sharp! ), and they interweave to form complex patterns, culminating in a "lock" which is held up at the end of the dance, as in the picture.